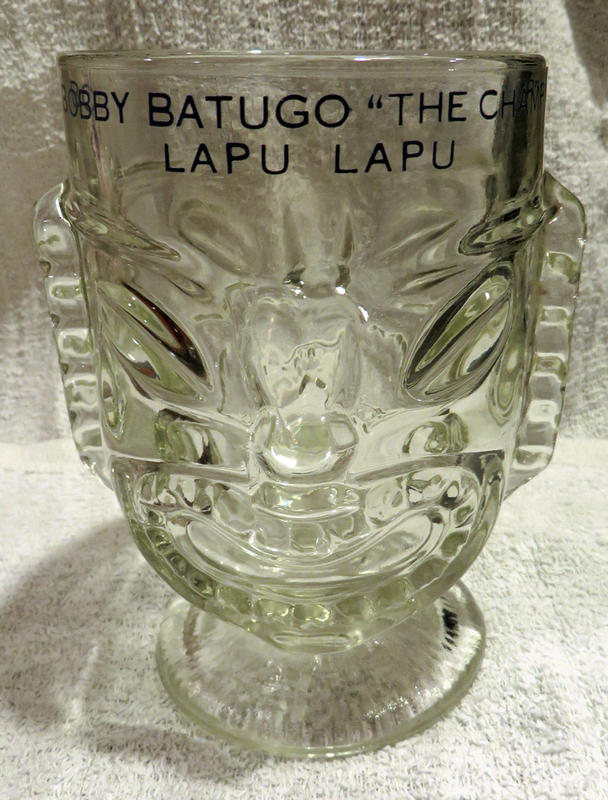 Bobby Batugo "The Champ" Lapu Lapu tiki goblet from Tip's Restaurants. 6 inches tall, mouth 4 inches wide. Intended for 16 oz. ; holds 22 oz. to brim. Master mixologist Bobby Batugo was a legend in the Santa Clarita Valley, and he put Tip Jardine's restaurants on the map with his award-winning alcoholic beverage concoctions. Born Valerio Gamet Batugo in The Philippines on April 26, 1906, he emigrated to the United States in 1926 with dreams of becoming a prize fighter. Stopping off first in Washington state, he hopped on a bus to Hollywood and got hired as a busboy in a restaurant owned by Charlie Chaplin. In a 1985 L.A. Times interview, Batugo said Chaplin had trouble with his given name, so "one day, (Chaplin) called all the help into the dining room to pick me a name. They called me Bobby." Meanwhile he moonlighted as a boxer for seven years and fought to a draw for the state title. Then in 1932, during Prohibition, he got a job as a bartender in a speakeasy. The next year Prohibition was repealed and he could go "legit." While serving movie stars at Sardi's in Hollywood, he landed a role in the morning radio show, "Breakfast at Sardi's." For eight years in the 1930s and '40s he traveled the country with the show, performing a bartending-comedy routine for a national audience. Batugo was working at the Key Club on Sunset Boulevard in 1948 when Jardine recruited him — not long after Jardine opened his original Tip's Restaurant at the southwest corner of Old Highway 99 and Henry Mayo Drive (where Interstate 5 and State Route 126 come together today). Batugo explained to The Times reporter that the move gave him the artistic freedom he didn't have at high-society clubs where management limited the amount of money he could spend on exotic liqueurs. At Tip's, way out at a place called Castaic Junction on the road to Bakersfield, Jardine let him do whatever he wanted. The sky was the limit. It was a smart decision on Jardine's part and a lucky one for the sparsely populated SCV. Batugo blended liquor, fruit juices and liqueurs into unique works of art — elevating mixology to levels not previously seen in the Newhall-Saugus area, and packing nearly all of the area's 21-and-older inhabitants into Jardine's establishment along the way. Batugo was at the top of his game when Tip's moved to Pico Canyon Road, in sight of the new Interstate 5 freeway. The only three-time national champion in United States Bartenders' Guild competition, Batugo won the International Cocktail Competition in 1973 with his drink, The Icy Sea, which used gin, rum, Amaretto, grenadine, triple sec and tropical fruit juices. Among his signature mixes were Tipsy (1971), The Best Year, The Test Pilot, New Day, Casa d' Oro, Lapu Lapu and The Universe, which blended vodka, melon (Midori) and pistachio liqueurs with pineapple and lime juices. 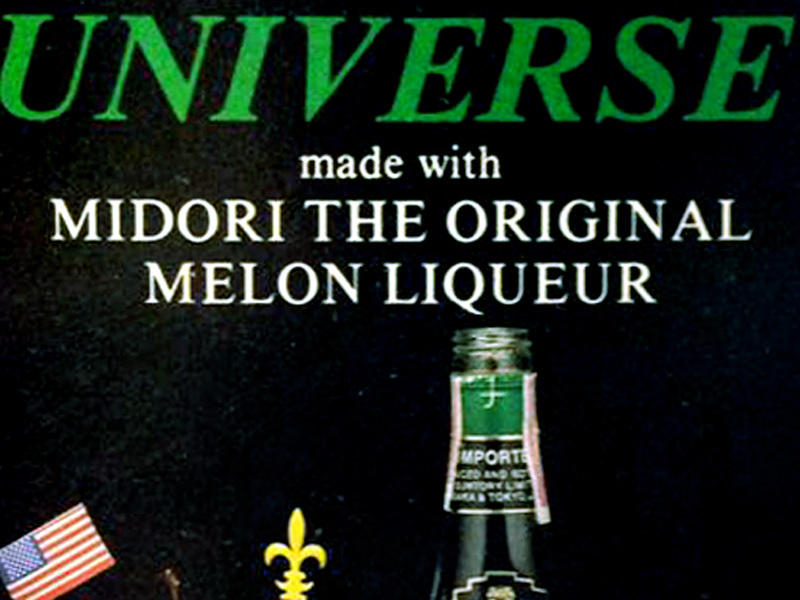 When Batugo's The Universe won the 1978 USBG competition, Midori manufacturer Suntory featured him in an international advertising campaign. Bobby's nephew, Mario Batugo of Santa Clarita, followed in his footsteps. Mario won the 1981 USBG competition for his rum-based Blue Heaven (with Amaretto, Blue Curacao, pineapple and lime juice, a pineapple spear and maraschino berry) — besting his uncle's vodka-based New Day, which took third place. Bobby's brother Loy Batugo (Mario's father) and another Tip's bartender, Leo Lindogan, would also win national contests. Bobby Batugo was living in North Hollywood when he died Oct. 1, 1996. He was 90. LW2604a: 19200 dpi jpeg from digital image; goblet purchased 2014 by Leon Worden.